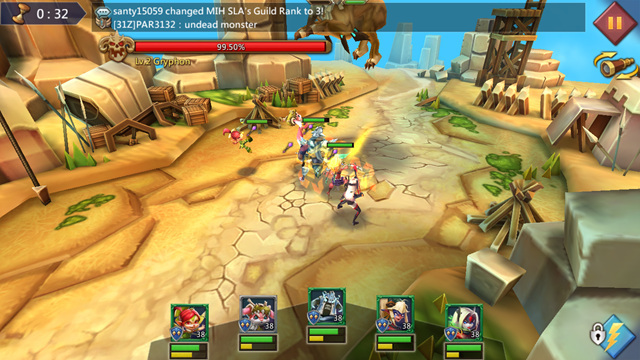 Lords Mobile is an open-space strategy RPG where players need to develop their own base, build an army, seize resources, destroy enemies' bases and other evil forces. It's all about getting resources, buildings and heroes' level as fast as possible. If you want to gain advantage over other players, of course you can spend real world money to buy gems, but you can also reach high Might in game without spending a dime, and only you need is following this free to play guide. The rest of the guide will be divided into several sections. To start with, we will be rushing to Castle 17. At level 17 Castle you get treasure trove and tier 3 troops and traps. These are crucial. To reach the Castle 17, you need to upgrade only the buildings which are required to upgrade your castle, and also upgrade your Academy at every castle level to unlock more research. You should build 1 Farm (impossible to have a positive upkeep at high levels, plenty of food from gifts), mix of other resource buildings. Build 2 or 3 barracks, 5 or 6 infirmaries, and manors for the rest. Once you reach castle 17 focus on upgrading your unique buildings to max first (the buildings you only have one of. Then max all your manors infirmaries and barracks, then you can work on resource buildings. Remember that resources aren't super important if you have a guild that will help you build as they will send you resources you need. Many of the resources you will need you can also get from cargo ship. I generally make every trade available except the 1 star trades that give food. Focus early on should be on building speed upgrade, gathering, vault and monster hunting (yes monster hunting). Monster hunting research will pay for itself if you are active. The more energy you get and the higher level monsters you can hit the more rewards you get, including gems, speedups, and materials for gear. It also makes you an asset to your guild if you can take down monsters. Once you get to castle 17 you will want to unlock t3 troops and traps. If you ever want t4 troops you need to finish all of the military and economy tree so keep that in mind once you have completed all the research we discussed previously. You should focus first on attacking Noceros, and Gryphons. You need their materials for your research and construction gear. 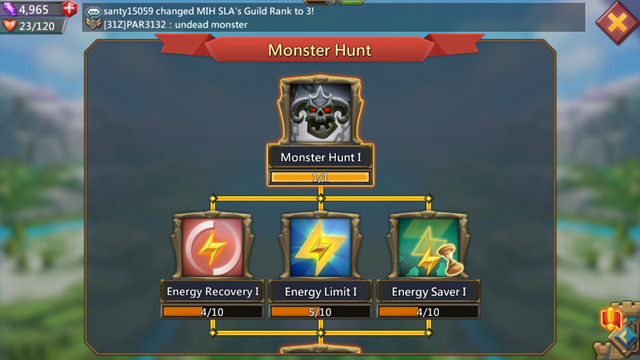 Help your guild kill t1 monsters but also hit level 2 and 3 monsters as often as possible as the higher the monster the better rewards. Speed ups should only only only only be used to finish hell events and solo events. In general, you want to go for tier 3 hell events and focus should be on completing research events as the others are too difficult. The only exception would be when you can complete an event that will give more speed ups than it will cost, or close to as many. If I can complete a train soldiers tier 1 or 2 event that will give me 2 hours in speed ups and only costs me 2 to 4 hours of speed ups I would consider it worth it. Early on gems should be used on getting your VIP level up. It shouldn't take much to get to level 6 or 7 and the free speed that it gives at the end of an upgrade is very helpful. Beyond that it is going to depend on your goals for the game. If you are looking to get t4 troops you need to spend nearly all of your gems on war tomes, cuffs and soul crystals to level up your prison, altar and battle hall. If you are just looking to be a strong t3 player you can use all your gems on speed ups and other things like Relocators etc. Guild coins can be spent on guild quest refreshes, these are good for materials and experience. You can also get VIP points early on with guild coins. Personally, I save all my gems and coins until guildfest when I can use them to finish easy challenges. You should upgrade your treasure trove as often as you can as it is the easiest way to get gems. Always invest the maximum amount for 30 days as it gives the highest reward. The big three should be your focus until they are all gold. The big three are Trickster, Scarlet Bolt, and sage of storms. They each give fantastic bonuses to either research speed or building speed, they also give monster hunt bonuses. These are administrative skills so they are active whether they are your leader or not. Trickster should be the first to gold grade as he gives research, followed by scarlet, then sage. From there it is all personal preference. Attack guards daily for easy experience and hero experience. Will also finish turf quests and gain gems as you make it higher. Don't. Seriously don't. If you want to make it to 10m might in this time frame you can't afford to lose any troops. You need to hide your troops carefully when you go offline. This means sheltering. Shelter always. Even if you are online shelter one troop and hero. You can't afford to have your hero captured or executed. Once your shelter is full ghost rally. (8 hour rally a dead base then cancel before it goes out, If you will be offline for more than 8 hours rally someone weaker than you 400 miles away. This will buy you 10 hours. ONLY DO THIS TO CLANLESS PEOPLE. Once your ghost rally is full you need to find a guildmate that is shielded and reinforce them. Always keep your troops safe. 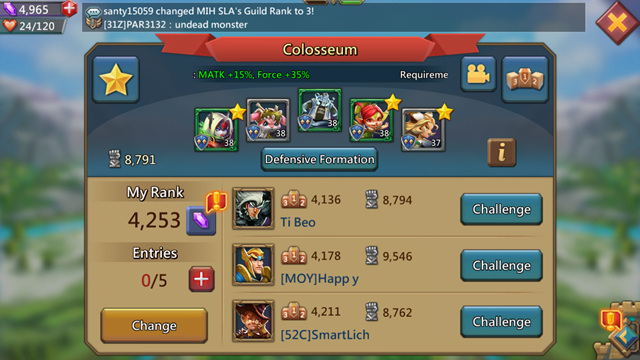 Help your guild with Darknests as often as possible. Rewards can be gems and speedups. The first few are pretty easy. There is also no rush for the first few. The final one is difficult. I used about 50k troops to brute force my way through. It took 4 or 5 attempts but I had plenty of infirmary space and your progress is kept after each battle. I wouldn't bother training any more t1 than you need to in order to finish the turf quests, you unlock t2 troops quick enough that the t1s are useless. Once you unlock t2 soldiers you should train soldiers around the clock. Once you have t3 soldiers you should only train T3. I won't get into troop composition as I have not actually been in a battle yet so my opinions on that are not proven yet.